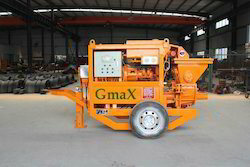 We are offering high quality range of Wet Mix Shotcrete Machine. The material is duly filled into the feeding hopper from where it fails into the chamber of revolving rotor. Especially in modern tunnelling projects, shotcrete is placed both for post-excavation securing and as a devinitive lining. With the top-shot procedure. 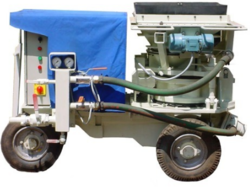 With rich industry experience & knowledge, we have been able to provide the best array of Dry Shotcrete Machine. HIGH QUALITY DRY SHORTCRETE MACHINES THE MACHINES PROVIDED CAN BE USED FOR SHUTDOWN PROJECTS WITHOUT THINKING FOR THE SECOND TIME . - The machine works on a dry mix principle. - The material is duly filled into the feeding hopper from where itfalls into the chamber of revolving rotor. With an objective to fulfill the demands of our clients, we are engaged in providing a wide array of Dry Shotcrete Machines. Shotcrete Machine is used for spraying concrete and mortar to do the sustaining works in Tunnels, Foundations, and Soil-Rock lope. It has the advantages of low dust constancy, high-strength of concrete layer and wide applicability. It is often used for concrete repair or placement on bridges, dams & other applications where forming is costly or material handling/installation is difficult. The Alpha 20 is an equipment for sprayed concrete specially designed by Semmco to work in underground mining. There are more than 20 units of this equipment working in the mining industry in Chile as well as in other countries, like Brazil, México and Perú, with excellent results.